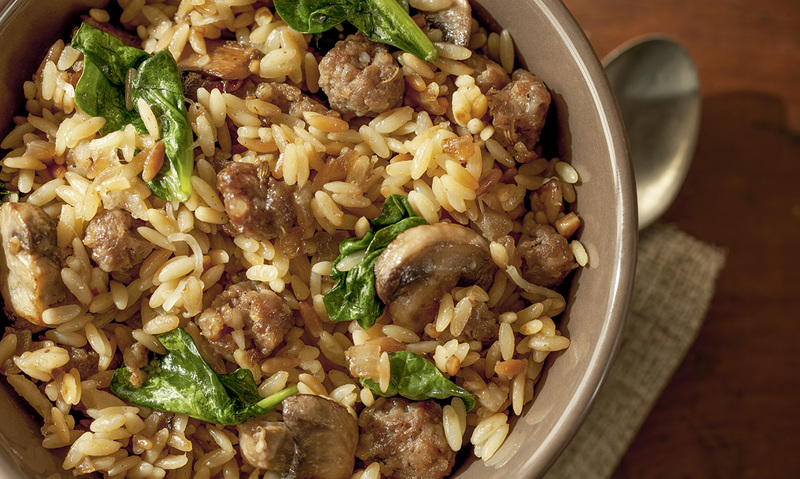 Our Italian Sausage takes center plate with mushrooms, spinach, and delicious orzo. A delightfully easy dish to make with just 10 minutes of prep time. Buon appetito! In a large sauce pan, melt 2 tablespoons of the butter in a medium skillet over medium high heat and add 1 cup orzo. Add chicken broth and bring to a boil. Cover. Reduce heat and simmer for about 15 minutes until the orzo is tender and the liquid is absorbed. 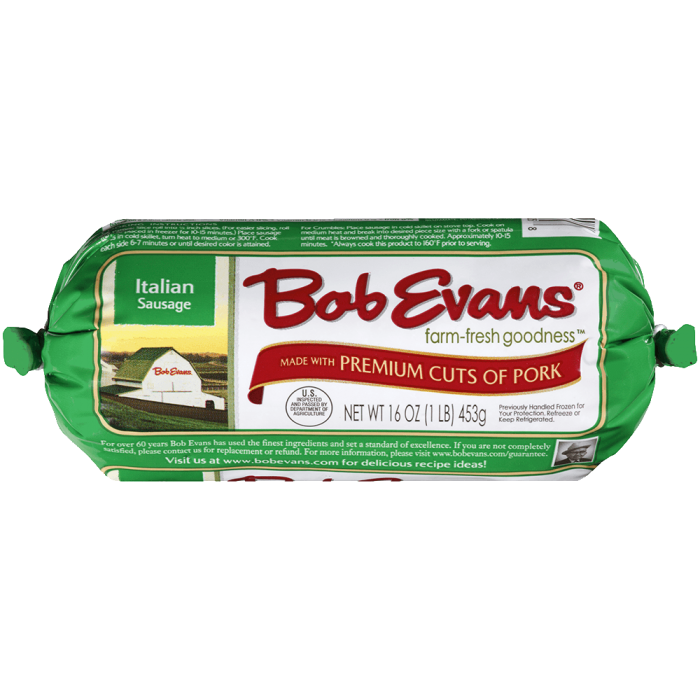 In a large skillet, add sausage and crumble over medium heat with a potato masher until fully cooked, about 5 minutes. Add onion and mushrooms and continue to cook until onions are translucent and mushrooms are tender. Add garlic to the pan and sauté 30 seconds or until garlic becomes fragrant. Add spinach and cover pan to allow spinach to wilt. Set aside until orzo is done. When orzo is done add the sausage mixture and 1/2 cup Parmesan cheese and mix well. Give it a taste and adjust the seasonings as needed. The Parmesan will add some saltiness to the dish, so be sure to give it a taste to ensure you don't add too much salt! 1 In a large sauce pan, melt 2 tablespoons of the butter in a medium skillet over medium high heat and add 1 cup orzo. 2 Stir until lightly browned. 3 Add chicken broth and bring to a boil. Cover. Reduce heat and simmer for about 15 minutes until the orzo is tender and the liquid is absorbed. 4 In a large skillet, add sausage and crumble over medium heat with a potato masher until fully cooked, about 5 minutes. 5 Add onion and mushrooms and continue to cook until onions are translucent and mushrooms are tender. 6 Add garlic to the pan and sauté 30 seconds or until garlic becomes fragrant. 7 Turn heat down to low. 8 Add spinach and cover pan to allow spinach to wilt. Set aside until orzo is done. 9 When orzo is done add the sausage mixture and 1/2 cup Parmesan cheese and mix well. Give it a taste and adjust the seasonings as needed. The Parmesan will add some saltiness to the dish, so be sure to give it a taste to ensure you don't add too much salt!